Late summer is wildfire season in much of America, and when those fires hit there’s nothing you can do but evacuate. There is plenty, however, that you can do in advance. Have you taken the necessary steps to protect your home and property from a wildfire? Have you created a defensible space? Do you have a tile or other non-combustible roof, free of debris and overhanging trees? Is your address clearly displayed on the street and is your driveway accessible for fire-fighting equipment? Have you done everything in your power to protect your home, property and yourself? When wildfires strike, it’s unrealistic to expect that the fire department can save every home—firefighters must work ahead of the fire and make tough choices about which homes they can save and which they cannot. It’s up to you to ensure your home can defend itself. First things first: have an evacuation plan. 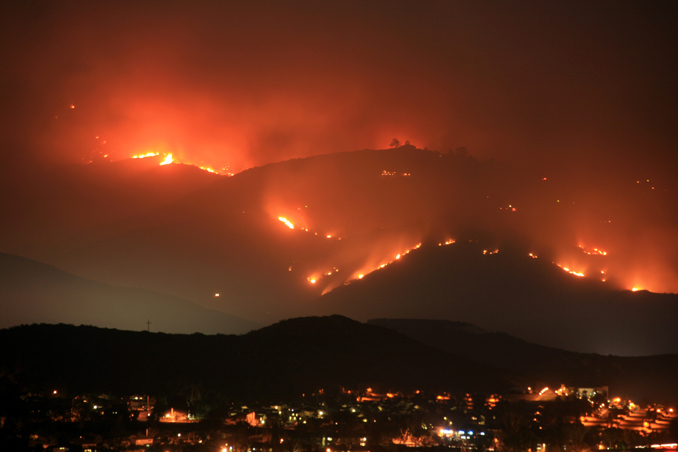 Did you know that most wildfire-related injuries and deaths happen during evacuation efforts? Dense smoke limits visibility and oxygen, making it difficult for you to breath and even for your car to operate. Extreme heat and flying embers in the air can lead to costly mistakes—by even the most prudent of homeowners. You may not be thinking clearly while trying to save your family, animals, and dearest possessions. Evacuate large animals first and early. In a widespread catastrophe it may take several days or even weeks to restore electricity and water. Your best option is to be prepared.